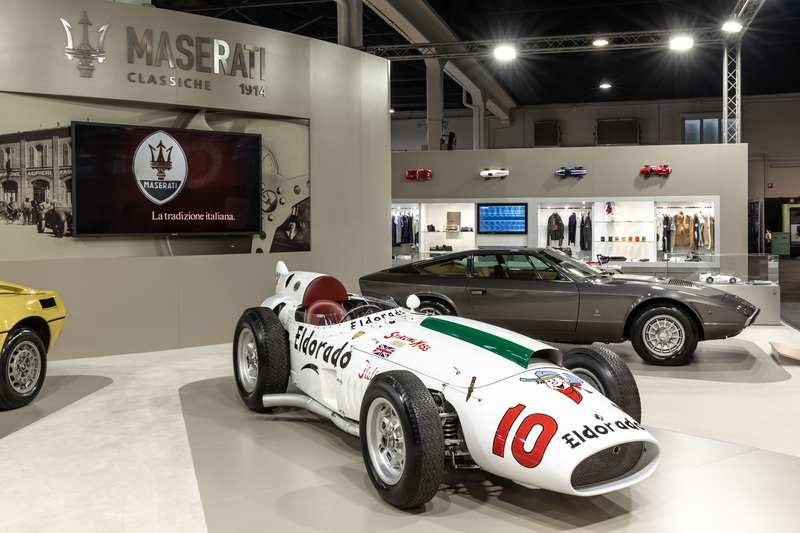 On 25th October 2018, in Modena, Maserati exhibited at the Auto e Moto d’Epoca Show in Padua, Europe’s biggest classic and contemporary car and motorbike fair. The event, in its 35th edition this year. In 1958 the Indianapolis 500 was exerting a stronger appeal than ever in Europe and over Maserati in particular, thanks to the many wins recorded by the 8 CTF. Maserati was therefore attracted by the 500 Miles of Monza, and actually prepared a specially constructed car to race on the city’s fast, technically demanding circuit. This was the Tipo 420M-58, better known as the “Eldorado” thanks to the famous sponsor suggested to the constructor by Gino Zanetti, owner of the ice-cream company of the same name. The car’s white bodywork therefore carried a large Eldorado logo, and hence its nickname. The car had a tubular chassis inspired by the reduced-weight 250F, the front suspensions of the 450S with the unusual feature of a lever damper on the left and a telescopic one on the right, and De Dion rear axle with oversized components. The engine was a V8 derived from the 4.5 litre unit, with displacement reduced to 4.2 litres and vertical carburettors. In view of the anticlockwise running direction chosen by the organisers of the 500 Miles of Monza, the engine was mounted on the left of the chassis, and not aligned with its longitudinal axis. The gearbox with just 2 speeds, the first only used for the start, was mounted on the rear axle which, interestingly, had no differential. The car’s overall layout provided excellent weight distribution, a factor more than fundamental for high cornering speed, particularly important at Monza, a circuit famed for its long, very testing banked “Parabolica” corner. After the initial test drives, the spoked wheels were abandoned in favour of light alloy alternatives fitted with large Firestone tyres inflated with helium for the utmost weight reduction. At Monza on 29 June 1958 the “Eldorado” with Stirling Moss at the wheel performed well in the first two heats, finishing in 4th and 5th places. Unfortunately, the steering failed in the 40th lap of the third and final heat and the car went off the track at over 260 km/h. In spite of the accident and retirement, Moss was still awarded seventh place by reason of the three heat results and the total number of laps completed. He walked away unscathed from the crash and, all things considered, the “Eldorado” too suffered only limited damage, proving the value of its solid structure. The Indy 500 race was dear to Maserati, which took victory in 1939 and 1940 with the driver Wilbur Shaw behind the wheel of an 8CTF. Shaw almost made it a hat-track in 1941, but was forced to withdraw during the penultimate lap while out in front, victory denied by a broken wheel. In view of the commercial success of the Bora, the first road Maserati with mid-mounted rear engine, in 1972 Maserati decided to develop a new, decidedly sporty medium-displacement car capable of holding its own in the highly competitive three litre sedan segment. The result was the Merak. The design of the new car was entrusted to Giorgetto Giugiaro’s Italdesign firm, which had already designed the Bora: the engine chosen was the 6-cylinder, V90° type C114 created for the Citroen SM. The design approach chosen for the project (code name AM122) had more than one point in common with the Bora, with which it had far more than a passing resemblance. The new car utilised the Bora’s platform as far as the doors, the same bodywork and, with slight modifications, the same suspension and steering systems too. The original characteristics were found in the rear, arising from the extraordinarily compact engine, which allowed two cramped extra seats to be created in the cockpit. The car was presented at the Paris Motor Show in autumn 1972 and was called Merak after a star in the constellation of the Great Bear. The Merak SS, this time equipped with a revised, upgraded version of the three litre C114 engine, was presented at the Geneva International Motor Show in 1975. The car’s weight was reduced, improving its weight/power ratio and thus boosting its performance. It also received minor restyling with the introduction of a large hood scoop to improve the cooling system. In 1977 a version with a two litre engine was also created, mainly for the domestic market, where the heavy taxation on cars with displacement over two litres was proving a strong deterrent to prospective buyers. This car was known as the Merak Duemila. The final version of the Merak model, called the Merak 80, arrived in 1979. It was basically the Merak SS model with a number of changes, most importantly the abandonment of the Citroen braking system (relations with the French firm had been broken off almost five years before) in favour of a latest-generation brake booster. The car on display on the Maserati stand is the only Merak to be built with a turbo engine. Yellow in colour, it was the prototype for a possible evolution of the model, developed to further upgrade its performance. Unfortunately, the project was halted and the car was never produced: however, Alejandro De Tomaso returned to the idea of a turbocharged engine a few year later in the Biturbo project. Bertone was commissioned to design the new, elegant 2+2 coupé intended to replace the Ghibli. The well-known, reliable 4.9 litre V8 engine was retained. The new car, presented at the 1973 Paris Motor Show, was named Khamsin, after a wind of the Egyptian desert. Khamsin in Arabic means fifty, the number of consecutive days for which the wind blows. With a monocoque structure, it was the first front-engined Maserati to adopt independent suspensions on all four wheels. With sleek, sinuous lines, styled by the pencil of Marcello Gandini, it featured a transparent rear section which gave the car an unusually light appearance. Its technical characteristics complied with the design standards of the early ’70s, so it was hit hard by the dramatic consequences of the oil crisis, after which some of its sporty features were toned down considerably. Because of this crisis, production of the car was phased out with just 430 units built. However, the Khamsin marked the introduction of the “GT” design philosophy, which prioritised performance without underestimating customers’ rising expectations in terms of comfort and space. The Khamsin was the last Maserati model developed under the technical management of Giulio Alfieri, an engine, racing and road-car designer of true genius, whose creations shaped the Brand’s history for about twenty years. The three classic cars on display on the Maserati stand belong to the Umberto Panini Collection. As well as the three exclusive classic Maserati models, the Trident stand also displayed the Levante S GranSport MY19 SUV in Bianco Alpi colour, a tribute to the white livery of the Tipo 420M-58 – Eldorado. The three litre V6 engine of the Levante S GranSport delivers a thrilling driving experience. With 430 HP at 5,750 rpm and a torque of 580 Nm between 1,750 and 5,000 rpm in Sport mode, it takes just 5.2 seconds to accelerate from 0 to 100 km/h. The top speed is 264 km/h. Designed by Maserati Powertrain in cooperation with Ferrari, the V6 engine is manufactured by Ferrari in Maranello: it combines outstanding performance, driving pleasure in all conditions of use and environmental-friendliness. Its 430 HP engine with Euro 6c homologation is in line with its competitors in terms of fuel efficiency, with 11.8 l/100 km and 273 g/km CO2 emissions on the Worldwide Light vehicle Test Procedure (WLTP), which reflects real driving conditions more accurately. In the best Maserati tradition, the petrol engine’s exhaust system is controlled by pneumatic valves to maintain the rich aural signature of the brand. In the default driving mode, the bypass valves are closed for a comfortable and discreet engine sound. In Sport mode, the exhaust valves are opened, giving the shortest possible route for the exhaust gases. This gives the Levante its maximum engine performance and the unique Maserati engine sound. Beneath the rear bumper, the exhaust gases emerge through two double tailpipes each side in polished steel. The design concept of the Levante MY19 combines coupé lines with interior space for five people and exceptional aerodynamic efficiency. “The Maserati of SUVs” is instantly recognisable from a distance, thanks to its imposing grille, which was inspired by the sensational Alfieri concept, but also pays homage to historic Maserati cars like the Tipo 60 Birdcage. Focused on the lower front fascia and the rear bumper, the elegant restyling of the Levante MY19 provides even sportier, more dynamic looks. In addition, Adaptive Full LED Matrix headlights are available as an option for the first time in the Levante range. Levante MY19 is available in no fewer than 11 exterior colours, including two brand new tri-coat shades: Rosso Potente, created to celebrate the racing heritage of Italian sports cars, and Blu Nobile with sparkling glass flakes glimmering under the sunlight. New interior features include the totally redesigned shorter-travel gearshift lever featuring a more intuitive shift pattern and improved operation. The driver now has the option to use it in automatic or manual mode simply by shifting the lever from right to left, while a new “P” button effortlessly sets the transmission in parking mode. With the new gearshift lever, the driving modes cluster in the centre console is even more user-friendly. In the elegant interiors of Levante MY19, Maserati introduces, for the first time the full-grain Pieno Fiore leather, which is like no other material in the automotive industry for its natural, soft feel and for its unique character. Pieno Fiore is available as an option in all Levante trims, in three colours with specific stitching on the seats and double stitching on the door panels. Three new lacquered interior finishes are available as well as the full-grain Pieno Fiore natural leather. The Maserati Integrated Vehicle Control (IVC) function has been incorporated in the Maserati Stability Program control for the first time in the Levante MY19, while the optional active Advanced Driver Assistance Systems provide Level 2 autonomous driving technology. Developed in collaboration with Bosch, the IVC is able to prevent rather than simply correct loss of control, providing enhanced active safety and better dynamics. IVC uses a smart, feed-forward controller that predicts driving situations and adapts the engine speed and brakes accordingly. The system helps drivers maintain control of their vehicle, instead of simply correcting driver mistakes as traditional ESP systems do. The ADAS (Advanced Driver Assistance Systems) package is available as an option in the entire MY19 Levante range. Although ADAS are valuable assets for ensuring a safer driving experience, Maserati also remains faithful to its core philosophy as a manufacturer of race-bred grand touring cars with superior dynamics capable of offering an unparalleled driving experience. This principle fully applies to the Levante, a high-end SUV that puts the driver first – a genuine driving machine that is not intended to be a self-driving vehicle. The addition of the active ADAS package in the Levante range further improves active safety in a variety of traffic conditions, but the driver should remain 100% in control at all times. Highway Assist: a “hands-on” function intended for use on highways or limited access freeways at speeds up to 145 km/h with the Adaptive Cruise Control activated. It reduces driver fatigue and consequently enhances active safety by allowing the car to keep itself centred in its lane and to adapt its pre-selected speed in full autonomy. The system employs a radar unit and a forward-looking camera and works with the EPS to control the direction of the car. The multi-function camera detects horizontal road markings and calculates the distance and speed of the preceding vehicle. Highway Assist includes a radio that provides road information, and a ‘hands on wheel’ detection system. The driver can override the system at any time. Lane Keeping Assist (LKA): it keeps the car centred in its lane with direct input to the Electric Power Steering while the instrument panel display shows the specific status. When the Visual & Haptic box is selected in the touchscreen display, LKA actively steps in with corrective steering torque. LKA uses a forward-looking camera that detects lane markers to determine the car’s position, as well as a radar for data processing. The system works at speeds between 60 km/h and 180 km/h and when the indicators are on, it is deactivated. Active Blind Spot Assist (ABSA): a system that attempts to prevent a collision during lane change by using two radar-based sensors to monitor blind spot areas. As well as providing a LED and acoustic warning, ABSA can communicate with the EPS to intervene with steering torque and prevent a possible collision. Traffic Sign Recognition (TSR)*: essentially, TSR prevents unintended speeding, providing the driver with real time information on the instrument panel about the current speed limit. Traffic Sign Recognition identifies speed limits for specific conditions, such as rain, fog or hour-specific limits, and uses map data from the navigation system to inform the driver in case actual signs are non-existent, invisible or not recognisable by the camera system. Adaptive Cruise Control (ACC) with Stop & Go function: the Levante is equipped with a cruise control system as standard. The optional Adaptive Cruise Control with Stop & Go function further increases comfort and safety when driving on main roads and motorways. When activated (between 30 and 210 km/h), ACC constantly monitors the space between the Levante and the vehicle ahead, maintaining a safe pre-set distance. If traffic slows or another vehicle moves in front, it slows the car down by making it coast or by engaging the brakes. Thanks to the Stop & Go function, the car will adjust to the target vehicle’s speed until it comes to a complete stop and will set off automatically if the stop is shorter than two seconds. Forward Collision Warning Plus (FCW Plus) and Advanced Brake Assist (ABA): FCW monitors vehicles ahead by means of a camera and warns the driver through visual and acoustic alerts when they are in danger of a possible rear-end collision. If the driver brakes and the system determines that they have not applied sufficient brake force, ABA will compensate for this. Hill Holder: the Hill Holder system uses the on-board sensors to detect the vehicle’s angle when parked facing uphill and keeps the braking pressure for a few seconds so that the driver has enough time to release the brake pedal and accelerate before the car rolls backwards. Hill Descent Control (HDC): HDC allows a smooth and controlled hill descent on snow or rough terrain without the driver needing to touch the brake pedal. When activated via the dedicated button on the steering wheel, the vehicle will descend using ABS to control each wheel’s speed. Surround View Camera and Park Assist: the Surround View Camera system uses four cameras in total and provides a clear 360° view around the car on a top-down image in the 8.4” screen. It is activated automatically in reverse gear or manually by pressing the soft button on the MTC+ display. Park Assist provides visual and acoustic signals of the distance between the rear or front bumper and a detected obstacle when reversing or moving forward. Four sensors in the rear bumper and six in the front monitor the area behind and in front of the car, respectively up to 2 and 1.2 metres. Visitors to the Maserati stand at the Padua Show enjoyed a preview of a model of the new exclusive limited-edition collection of bicycles designed by Montante Cicli especially for Maserati. In this case, Montante has drawn inspiration from the 1957 Maserati 450S. A Coupé with curvaceous, elongated lines, it took part in the 1957 Le Mans 24 Hours, but luck was not on its side. Driven by the Moss/Schell pairing, it only lasted 4 laps before being forced to retire due to a transmission problem. The vintage bicycle created by Montante Cicli inspired by the 450S is in steel with a red finish and black leather fittings. An aggressive, racing-style handlebar further underlines its truly sporty, feisty character. Representing the prestige association with Bulgari launched in 2012, the Trident stand displays the two Octo Maserati watch models. The GranLusso and GranSport by Bulgari are exclusive watches specifically intended for owners of the Brand’s cars; the spectacular dial (with retrograde minutes and jumping hours) resembles the rpm-counter of a Maserati, while the stitched leather strap recalls the upholstery. Maserati Store is also present with a wealth of products, especially the “Maserati Classiche” line, inspired by the heritage car world, with the Brand’s most iconic historic cars featuring in the patterns and patches which decorate the garments. They will be available for purchase from the on-line e-commerce site using the monitor provided in the store area. “Maserati Classiche”, which has curated the Brand’s presence at the show, is an entity entirely dedicated to classic Trident cars and the promotion of the Modena firm’s great automotive heritage built up in almost 104 years of history; for the occasion, some of the world’s top experts on the cars which shaped the Brand’s history will be at the Maserati stand, happy to answer queries and satisfy the curiosity of the customers and fans attending the show.